Joy Beth Smith is not married, but she wants to be. 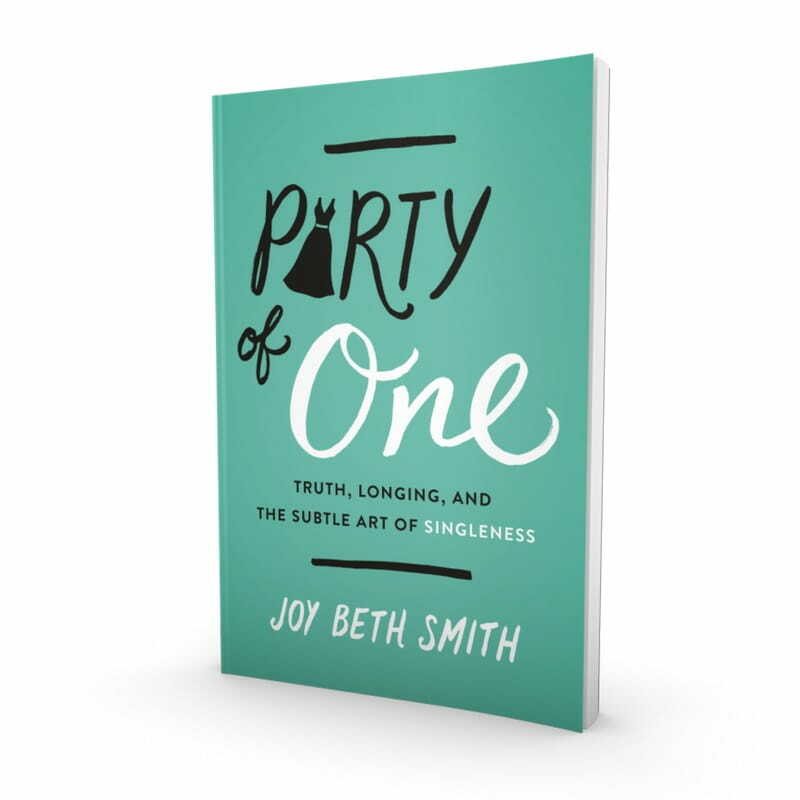 Her first book, Party of One, isn’t like most Christian books on singleness I’ve read, which were usually a married person’s success story of how to get through singleness and do it well. Instead, Smith offers an honest glimpse into the modern Christian single’s adventurous, confusing, and lonely world. She offers more questions than answers, and more perspectives than her own. Smith reports from the trenches, weaving testimonials throughout her book, which she collected from Facebook polls and roundtable discussions of single women in a handful of different Christian hub cities like Chicago, Nashville, Dallas, and Lynchburg, VA.
Smith writes for Christian single women who have struggled with hearing unhelpful, unbiblical advice often given by well-meaning people in their churches. But married people also have a lot to glean from Party of One, myself included. I married my husband one year ago, so I am not currently struggling with singleness. I’ve heard that mothers forget the pain of childbirth once they hold their beautiful new babies, and I believe this memory loss similarly affects many married people. I was single for most of my 20’s, and I can still remember some details, but reading Party of One helped me remember some of the common struggles and issues that singles face. Singles are confronted with confusing cliches. I’ve heard these as a single woman, but where are they promised in Scripture? Throughout the book, Smith looks at these and other platitudes, identifying what they really mean and if they are found in Scripture. If it’s not true, helpful, or biblical; it needs to go out the window. Singles hear a prosperity message mixed with the gospel. I was also surprised when Smith uncovered some Christian clichés and revealed them to be prosperity gospel messages. The connections were compelling. Instead of promising health and wealth, we promise relational prosperity. Even though God did not promise matrimony to every Christian, we tell our single friends: Just follow Jesus faithfully, and he will give you a husband. But why? Why would gospel-believing church-goers speak these false promises to hurting friends? 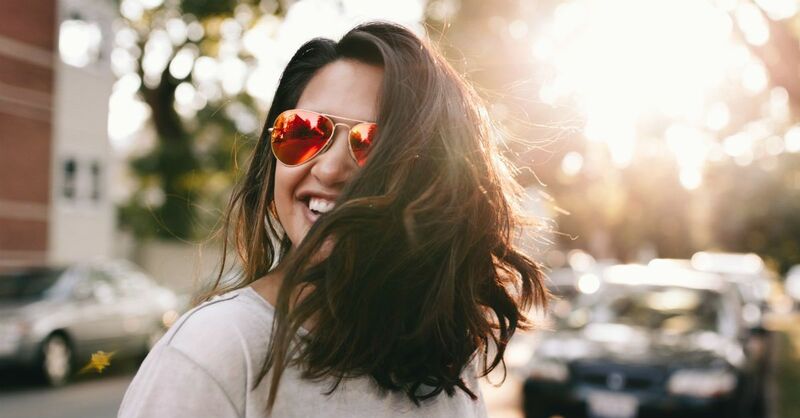 Singleness is seen as a messy problem. The church has a hard time walking with singles who want to be married because we are uncomfortable with pain, especially with seemingly unreasonable and prolonged pain with no end date in sight. A lot of the bad advice the church gives to singles seems to stem from this aversion to pain and the church’s honest care for singles in the pews. Party of One is not really a guide for singles ministry. But it’s an earnest plea for the church to stop looking at singleness as a problem to fix and to start viewing it as a valid stage of life. The hardest part about being single is one of the greatest lessons, I believe, married people can learn from singles. Each day has the capacity to alter the rest of our lives. In this life, marriage is not a guarantee, nor is staying healthy and growing old with your spouse. Only God’s faithful love and character is guaranteed. Singles need to hear they'll be okay. "Party of One" tackles singles and sexuality. The book is divided into three parts devoted to promises and platitudes, singleness and sexuality, and dating in the church. In the second part, Smith addresses many complex and hush-hush issues that affect Christian singles such as masturbation and sexuality. Again, she offers more questions than answers, and she quotes experts from clinical psychologists like Dr. Kim Gaines Eckert and theologians like C.S. Lewis. The solution may be simpler than you think. In this section, as well as throughout the book, one of the very few definitive solutions that Smith offers is for the church to talk more about the issues. I appreciate her valuing the church discussing important life issues in community. I also appreciate that she was not quick to assign inappropriate solutions to complex problems. But…just talking more about it? Is that the best we can do? This picture of Christians striving for holiness together changed my mind. They regularly, vulnerably talk about their struggles because they are highly aware that they can’t do it alone. Singles and the church need each other. Smith points out that the church’s answer to the struggles of singleness has been focused on purity training in youth groups and encouraging young adults to hold on until marriage. But what if marriage happens beyond age 25 or not at all? Reading Party of One is a good place to start. I recommend this book to any woman who is single and struggling – your “party of one” can be valid, worthwhile, and deeply meaningful. To marrieds and church leaders, this book is a rare opportunity better understand a growing and marginalized group of people who feel alone in our churches. Joy Beth Smith is a managing editor with Christianity Today and winner of the Evangelical Press Association's Higher Goals in Christian Journalism Award. She’s been published in the New York Times, Washington Post, Salt Lake Tribune, Virginian Pilot, and Christ and Pop Culture. After earning her MA degree in English Lit, Joy Beth had a brief stint as a teacher, but now she happily resides in the Chicagoland area, where she no longer has to give anyone permission to go to the bathroom.